I don’t have the Mega alert function turned on, on my pager. So when my phone receives a text message, it can be one of two things:- Vodaphone special offer or a Mega alert from RBA. "Oh no it’s a Mega alert", I shout out in the middle of the office…Nobody blinks an eye lid as they are quite use to me talking to myself these days…..Oh bugger…. I need the bird… and I am busy at work…. and I have no money to go….. and I am going with a friend to watch Arsenal play Manu at Emirates on Saturday. Plus my Mum needs a lift to the hospital on Friday. Well this is obviously one bird I will have to miss isn’t it? These are my thoughts at 13:52. As the minutes tick away at work, I started to think about all the awfully nice twitchers that wouldn’t dare grip me off, if I missed the bird…. not much, it would be unbearable. I have a decision to make!…Do I go tonight and use my last full day of annual leave and upset pretty much the whole family and friends with my decision? I’ve also got to take into account how focused I will be at work on Friday when the pager messages flood in saying how well the Mourning Dove is showing. Sorted…I am definitely not going!!! At 3:56 the bird gets the better of me. On the pager reads "W.Sussex Lift offer to W. Isles tonight tel.Garry on 12345678910…"
I very quickly arrange for my Arsenal friend to come around my house that night to take both of the Arsenal tickets off of me. I get my wife to take my mum to the hospital on Friday, get my car full, and watch the clock tick away every minute to happy time of 17:00 when I run to my car like a lunatic. I get home at 17:30, and I don’t bother eating the meal my wife has prepared for me, I don’t bother packing any clothes or food… I just get out of my work clothes and get the birding gear on…capable of withstanding sub-zero temperatures. I picked up John Benham at Leatherhead at 18:30pm and then make my way to Steve Nutalll’s rendezvous point, which is junction 2 of the M54. Then last pickup point is Junction 15 on the M6 to meet a 17 year old called Dan Pointon. Now all I have to do is put the car into Autopilot and sleep all the way to Uig??!! Then Steve can give me a nudge if there is a Red Deer in the road. Steve has been with me on a 4 to 5 twitches in the past and our connection rate is currently at 100%. This is Dan’s first trip with me, and I must say I am quite impressed on his rarity knowledge of dates and places, considering he has only been twitching for 2 years. Why are people so interested in the birds they haven’t seen. I just get p*ssed off , when I recount the birds I could have seen like Golden-barred Wobbler at Tesco in Kent etc etc! We arrived at Uig at 7:15am on Friday, to be greeted by about 40 cars containing mainly "Premiership Type Twitchers ". One of the cars had a large section of his Bonnet & Bumper missing, this was due to hitting an Elephant on route….no, silly me I mean I mean a Red Deer. I got out of the car and started chatting the usual mumbo jumbo to some of the Premiership listers. Then Stuart Piner receives notification that the Dove is still present…..A big Yell sounds around the quay and I do I a bit of body popping to show my joy (if you missed it, don’t worry I am crap at dancing anyway). Shortly after this the ticket office opens, all 85 twitchers run/walk fast to the kiosk pushing and shoving and jumping queues, like their life depends on getting a ferry ticket for the car. (Costs are £59 per Car + £15 per passenger). The reason for the panic was that somebody (who I cannot name) was rumouring there was only 10 remaining car spaces on the ferry. Fortunately we all got on and there was no need to panic. Premiership listers are the worse! When a bird has been at a site for 5 days and you roll up on a Saturday to rub shoulders with the assembled low listers/ dudes, nobody starts panicking about getting boat tickets etc do they? The ferry departed Uig at 9:40 and arrives at Lochmaddie at 11:10. On the ferry I enjoyed the Scottish Breakfast which only cost £4.90. My car was almost the last Car to get off of the ferry, as it was parked on the moveable deck section of the boat. We quickly lost all the cars hurtling at pace to "Clachan a luib" and we also had bad directions and got lost trying to find the site for ourselves. Dan rang some friends and soon got us back on the right road. Phew! We arrived at site just after Midday and the weather was not good. It was cold, miserable with horizontal rain. 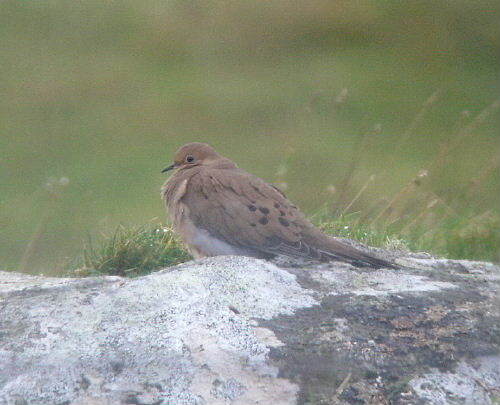 The Dove was very distant, sitting on a stone, facing away from us and getting soaking wet. Some birders could not be bothered to wait for better views and raced back to catch the same ferry going back to Uig. Thank god I am not a tick and run twitcher!…they must have only seen the bird in heavy rain for less than 5 minutes. The rain eventually stopped and the remaining 50 twitchers had smashing views of the Dove as it flew and perched on the very close seeded path. Other birds seen on the island included Red-breasted Merganser, Red-throated Diver, Rock Dove, Peregrine, Hen Harrier, American Great White Egret?, Ring-necked Duck, 3 Golden Eagles etc etc. My crew all splashed out £12 each and stayed at the Bunk House in Lochmaddie. That evening 3 of us went out to the Loch Maddie Hotel for some dinner. I recommend the Beef & Ale Pie (£7.95), let me know what you think? It will knock your Shaven bo**ocks off, if you know what I a mean. Then back to the Bunk house for more exciting tales of woe with the Premiership boys. One chap from Suffolk with a lisp was also staying at the Bunk house and he made many of us laugh re-counting one of his twitches when he ran over 2 domestic cats in a housing estate! What speed was he doing, I wonder… I also enjoyed talking to Pete Hutchins. Only the second person I know to wear shorts in the winter, no prizes for guessing who the other is? Pete tells he has only got a small list of birds in Britain….550 to be exact (I wonder if that includes PEACOCK? )…..Hearing about his impressive list nearly made me fall of the back of my chair. Then he tells me his son of 13 is fast approaching my meagre total. The next day we catch the 7:30 ferry back to Uig. On the journey back we see Storm Petrel, 3 Black Guillemots, 1 Pom, 2 Arctic Skua’s, GN Diver etc etc. Just off of Skye we see a car pulled over in a layby, and he informs us that he has got and Adult White-tailed Eagle circling low overhead.. We all get amazing views of this bird, I found it best to watch the bird laying on the bonnet of my car. I must remember next time to bring a cushion for my head. Got home Saturday 21:45.Great trip, it cost me £87 + food, and the best news is that my mate watching the Arsenal match, managed to re-inburse me the full £67.35 for the spare ticket I gave him.